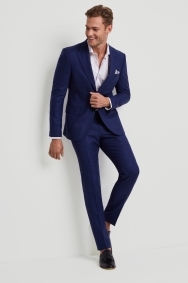 Be bolder with your go-to blue suit. 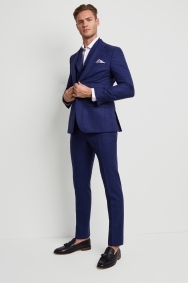 Skinny fit and in a bright tone, this suit will see you standing out for the right reasons. 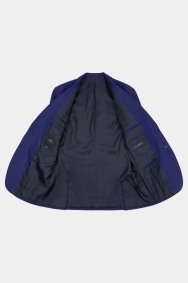 It’s an on-trend choice thanks to the richly textured bouclé finish and the addition of lapels on the waistcoat. 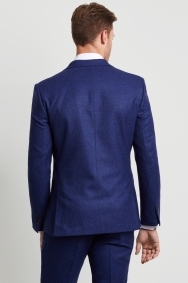 Enjoy looking chiselled as the skinny fit sits close through your body, and be assured that the 92% virgin wool material has a fine weave for a smooth and almost silky finish. 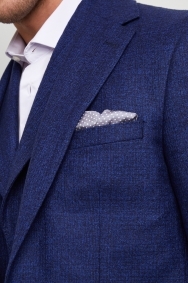 This 3-piece will hold its own with simply a white shirt and pocket square to complete the look. 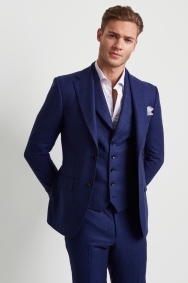 Skinny fit suits feature narrower shoulders, slimmer lapels and a shorter length jacket, along with trousers that are slim through the leg and hem. This close-fitting style is our narrowest fit and creates a sharp, contemporary silhouette that works well in formal and casual settings. To complete the look, skinny fit suits are best worn with extra slim fit shirts, which again are expertly tailored to flatter your physique. my first suit ever. so decided to spend some money on it for once. fit was close to 100%. experience in the shop was nice. probably will shop there again. recommended place. Great suit and amazing staff. Nothing was too much trouble. This is my third suit and I would not get one from anywhere else!